A 59-year-old man presented with a cholestatic liver profile 20 months after undergoing deceased donor orthotopic liver transplantation (OLT) for hepatitis C cirrhosis. Doppler ultrasonography was unremarkable and MRCP could not be performed due to presence of an implantable cardiac device. ERCP was performed and revealed a high-grade anastomotic stricture that precluded passage of the guidewire despite multiple attempts and different maneuvers, including a 0.018 hydrophilic guidewire and a rotatable sphincterotome. Failure of endoscopic approach would have necessitated consideration of a percutaneous transhepatic approach (PTC) or surgical revision of the biliary anastomosis. We then decided to attempt guidewire passage through the stricture under direct vision using single-operator cholangioscopy (SpyGlass, Boston Scientific, Marlborough, Massachusetts). Cholangioscopy revealed extrusion of bile through a “pinhole” orifice, enabling us to identify the biliary stricture. We were then able to traverse it with a 0.021 guidewire under direct visualization (see video). Sequential balloon dilation and stent placement were then performed, with resolution of the anastomotic stricture and complete normalization of liver tests. The patient continues to do well more than a year later, with persistently normal liver tests. I felt that this video would serve an important purpose to highlight the role of single operator cholangioscopy in the endoscopic management of high-grade post-transplant anastomotic strictures. Due to vulnerable blood supply of the bile ducts, biliary strictures represent an important cause of morbidity in transplant recipients, with a reported incidence of 5% to 15% following deceased donor OLT. As was the case in our patient, later onset anastomotic strictures most likely indicate fibrotic healing arising from ischemia at the end of the donor or recipient bile duct. With advances in therapeutic endoscopy, non-operative management of biliary complications has become the preferred approach. However, the success of endoscopic therapy relies on the passage of a guidewire proximally through the stricture during ERCP. A failed procedure usually necessitates PTC or revision surgery. PTC is still considered a second-line option because of its invasive nature and potential for complications including bleeding and bile leak. This video highlights a novel approach to enable successful guidewire placement for endoscopic therapy of high-grade post-transplantation anastomotic strictures. Figure 1. High-grade post–liver transplantation anastomotic stricture. First described in 1976, per-oral cholangioscopy is a non-invasive endoscopic method used for direct visualization and simultaneous therapeutic intervention of biliary pathology. Approved by the FDA in 2005, the SpyGlass system, in contrast to traditional dual-operator cholangioscopes, allows a single endoscopist to operate both “mother and baby scopes” and by providing direct visual access to the biliary tract, assists in the subset of patients who fail conventional ERCP by acting as a guidance system for passage of the guidewire through tight strictures. The success of this technique in our patient obviated the need for consideration of PTC or surgical approach. 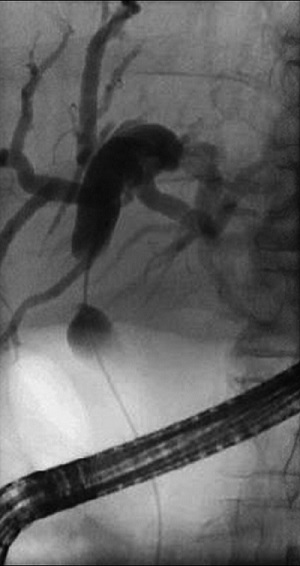 In summary, this case highlights the role of per-oral single operator cholangioscopy in the treatment of high grade post-transplant anastomotic strictures and underscores the need for inclusion of this technique in the armamentarium of therapeutic endoscopists involved in the management of biliary complications in liver transplant recipients.